PMI for the manufacturing sector slowed down from 53.7pt to 53.4pt which was below market expectations at 54pt and remains lower compared to other CEE countries and EU peers. 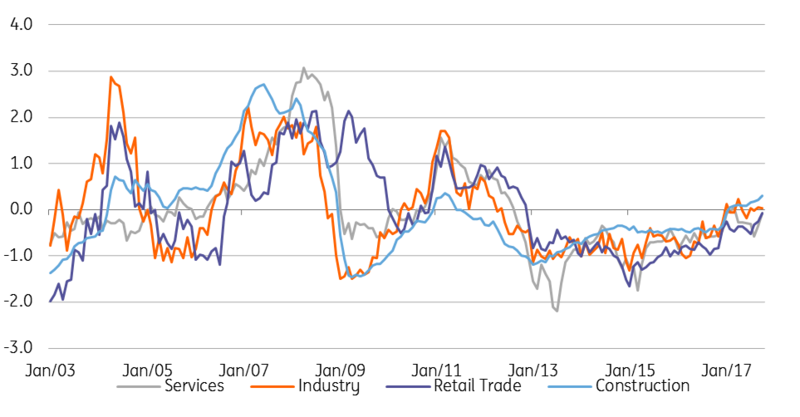 Still, Markit comments present a rather upbeat outlook on the sector’s performance. The decline was related mainly to lower assessment of current production, whereas forward-looking indicators remain sound. New orders component maintained nearly three-year top, also the pace of employing workers accelerated. All in all today’s data remains consistent with the nearly double-digit growth of industrial sector in October. We expect 9.2%YoY with supportive calendar and base effects. After robust 3Q17 (7.2%YoY) performance in the current quarter is still likely to exceed 6%YoY (at seasonally adjusted basis), well above long-term trend. Secondly, Markit comment focused on increasing producer price expectations of both inputs and outputs. Component describing prices of finished products achieved the second highest increase in the last six and a half years. So far the PMI results contradict other available surveys. Other monthly indicators show price expectations close to a long-term average level rather than abruptly accelerating. We expect PPI to decline close to 0%YoY in the yearend, reflecting strongly negative base effect.